Each site is issued a unique SSL certificate for identification purposes. 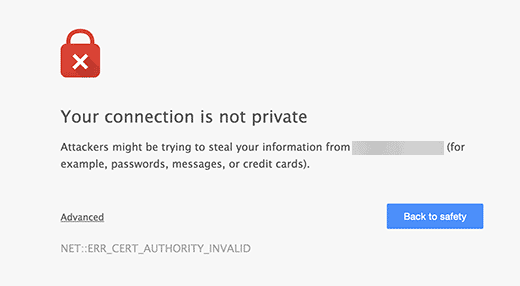 If a server is pretending to be on HTTPS, and its certificate doesn’t match, then most modern browsers will warn the user from connecting to the site. Now you are probably wondering, why would you ever need to move from HTTP to HTTPS and install a SSL certificate? If you are running an eCommerce website, then you absolutely need a SSL certificate specially if you are collecting payment information. Most payment providers like Stripe, PayPal Pro, Authorize.net, etc will require you to have a secure connection using SSL. Recently, Google also announced that they will be using HTTPS and SSL as a ranking signal in their search results. This means that using HTTPS and SSL will help improve your site’s SEO. 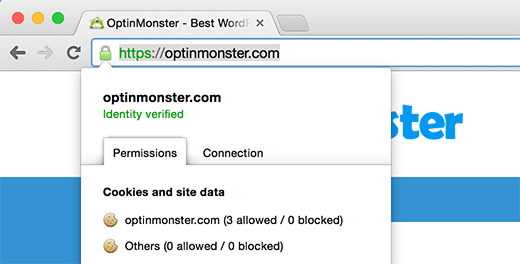 We already use SSL for our eCommerce sites like OptinMonster, Soliloquy, andEnvira Gallery. We will also switch all content sites to SSL as well. We just added SSL for Syed Balkhi’s blog (our founder). We’re often asked wouldn’t SSL and HTTPS slow down my WordPress website? In reality, the difference in speed is negligible, so you should not worry about that. The requirements for using SSL in WordPress is not very high. All you need to do is purchase a SSL certificate. Some WordPress hosting providers offer free SSL with their plans. Siteground, one of our favorite providers, offer a one year free SSL certificate with their “grow big” plan). If your hosting provider does not offer a free SSL certificate, then you can ask them if they sell third party SSL Certificates. Most hosting providers like Bluehost sell them around $50-$200. You can also buy SSL from providers like Godaddy. Once you have purchased a SSL Certificate, you would need to ask your web hosting provider to install it on your server. This is a fairly straight forward process. Now if you’re adding SSL to your existing site, then you need to setup WordPress SSL redirect from HTTP to HTTPS. Don’t forget to replace yoursite.com with your site URL. By following these steps, you will avoid the WordPress HTTPS not working error because all your site URL and content will be on SSL. Now if for some reason, you only want to add HTTPS and SSL on specific pages of your site, then you would need the plugin called WordPress HTTPS (SSL). 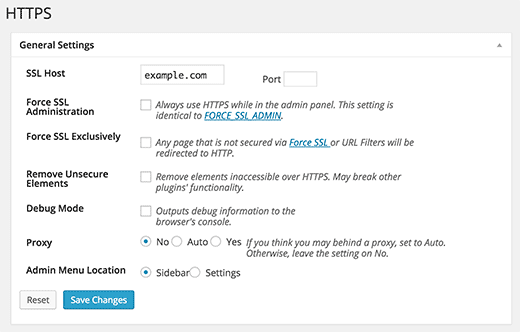 First thing you need to do is install and activate the WordPress HTTPS (SSL) plugin. Please note that this plugin hasn’t been updated for a while, but it works fine and is safe to use. 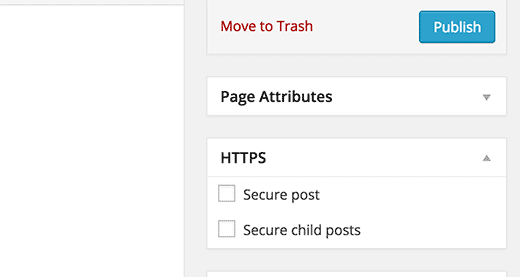 Upon activation the plugin will add a new menu item labeled HTTPS in your WordPress admin. You can click it to visit the plugin’s settings page. The first option of the settings page asks you to enter your SSL host. Mostly it is your domain name. However, if you are configuring the site on a subdomain and the SSL certificate you got is for your main domain name, then you will enter the root domain. 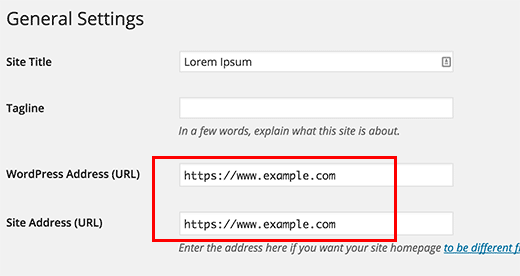 If your using a shared SSL certificate provided by your web host, then you will need to enter the host information they provided instead of your domain name. In some cases if you are using a non-traditional SSL host and need to use a different port, then you can add it in the port field. This works if you only want to use SSL on specific pages like shopping cart, checkout, user account pages, etc.